Colton graduated from Wittenberg University in May of 2014. Throughout his time there, he was actively involved in Student Senate, Habitat for Humanity, Campus Ministries, Intramural Sports, and WUSO 89.1 fm. His interest in admissions was sparked through the Orientation Assistant program at Wittenberg, which allowed him to help incoming students with their transition to college. 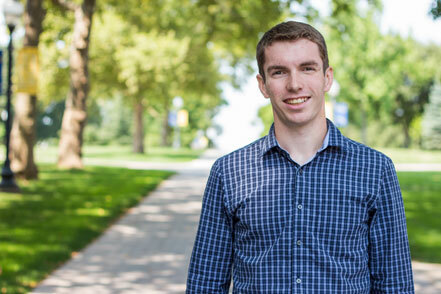 Colton soon realized that the transitioning process has a lot to do with whether or not the student is a good fit for the institution and took an internship with the Office of Admissions during his senior year. There are thousands of college options out there, with a variety of exceptional programs and opportunities, and he hopes to help students find a place where they can live life to the fullest, learn without boundaries, and leave as an expert in their field. Colton was drawn to Juniata by the beautiful location, the welcoming community on campus, and the outstanding experiential learning that is available. Colton has lived in New Jersey and Ohio, and has travelled extensively throughout the Midwest. Skydiving, visiting every continent, and marrying Jennifer Lawrence are just a few of the things on his bucket list. He is the counselor for New Jersey, Ohio, Michigan, Indiana, Kentucky, Illinois, Wisconsin, Minnesota, Missouri, Iowa, Nebraska, North Dakota, and South Dakota. Feel free to reach out to Colton with any questions throughout the college search process!